An Historic Herd Name is bestowed upon those outstanding herds that have not simply “made a name” for themselves and bred some top-quality animals, but have contributed significantly in a number of specifically defined areas to a breed or breeds of dairy goats. How to nominate a Historic Herd Name? Contact the Chair of ADGA’s History Committee. He or she may be able to assist you directly by providing information directly or indirectly by directing you to appropriate sources for the information needed to complete the nomination application. Contact the ADGA office. They will likely have access to herd name and pedigree information, milk records, spotlight sale animals, pictures and other pertinent data. Contact the National Agricultural Library. This is the repository for ADGA’s historic documents, journals and other materials and have research librarians who can help locate specific information. Discuss your research efforts with your local goat breeders, active or retired (you never know who might have a collection of journals or other relevant documents). Contact dairy goat organizations, both the ones in your own area (again, there are often surprising resources in the hands of local breeders) and in the area where the herd in question was located. Contact the appropriate breed club or clubs. Most breed organizations have collected significant historic materials. Search through breed publications, newsletters and buck books. Go “online.” If you don’t personally have a computer, go to your local library where you’ll find not only the necessary equipment but folks willing and able to help with your search. Ask on breed-specific lists – a single message reaches a remarkable number of potential information sources. Try District lists; again, lots of helpful people can be reached and queried with a single message. Contact (by phone, letter or email) magazines, newspapers and historic museums in the area where the individual, organization or herd was active. You may be pleasantly surprised how much data can be gleaned from old news stories, photos and older residents of the target area. Be sure and pursue the archives of any agricultural publications in the region. Do remember that ADGA used to be AMGRA (American Milk Goat Record Association) and that many early goat folk also belonged to AGS (American Goat Society) . . . so keep those “acronyms” in mind while searching. Does this seem like a lot of work? You’re right! But it is also a “labor of love” and is infinitely satisfying (the hardest part will be staying focused on your task. It is so easy to get lost in the fascinating details of history). If the owner or owners of a herd name that meets the above requirements is 65 years of age or older, has made a significant genetic contribution to a breed or breeds of dairy goats, and has registered dairy goats with ADGA the past 25 consecutive years, this herd name will be included in the Historic Herd Names even if being currently used by the owner(s). Historic Herd Names are not transferable. This does not apply to herd names with two or more owners unless all owners meet all requirements. In the event the designation of a historic herd name is offered to a herd owner, they must agree in writing with the ADGA office to not ever transfer that herd name under any circumstances. If the owner chooses not to accept, it will be deleted from the Historic Herd Name list. Establishment of the herd. When? Where? By whom? Foundation animals? How many? How chosen? Is the owner still around to interview? How about other breeders familiar with the herd history or who own animals descended from that herd? These criteria can be researched through pedigree records of particularly significant animals. Why were these animal significant? Milk records, show records, progeny records. Progeny or production pedigrees ordered from the ADGA office, if available, are very helpful (in researching one nomination, it was found that a progeny printout of just one of the foundation bucks of the herd yielded 275 pages with 13 listings per page – a total of 3575 registered progeny with hundreds of herd names throughout the United States!) Information can often be gleaned from old show catalogs, publications, Top Ten lists, spotlight sale publicity, etc. Did they produce important progeny? Is the genetic contribution still evident in contemporary herds? “Well-known” is relative. A herd, “well-known” 20-40 years ago, may no longer be widely remembered (except in a vague, generally understood sort of way), yet would have qualified easily during its contribution years. Documentation of “well-known” is still possible through the utilization of historic resources. 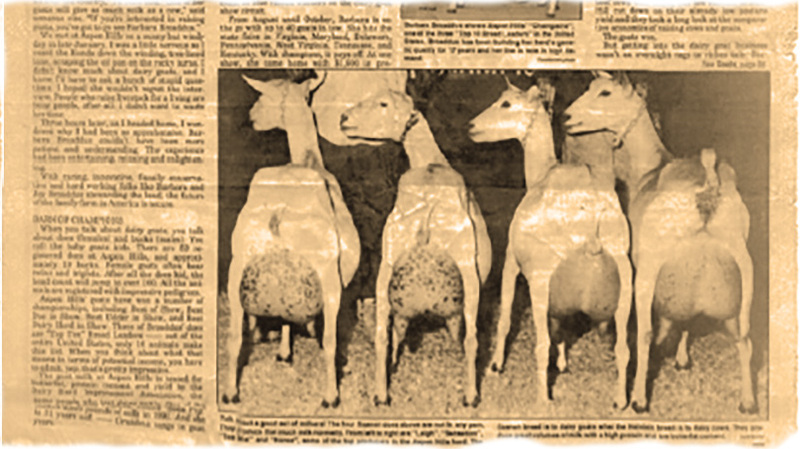 Advertisements in old journals, both in terms of the herd itself and of other herd ads featuring foundation animals from the nomination candidate’s herd or “bragging” about show wins or significant purchases. An historic herd nomination is basically a story. While you may certainly write individual answers to the questions above and list them, a nomination presented in “story” form serves a double function. The story can first be used by the Awards committee in their evaluation then, if the nomination is accepted, remain available to inform future ADGA members about the herds and the owners who most significantly contributed to the history of their breeds and professional organization. If you would prefer to do the research, but find someone else to write the story, there are many talented ADGA members who may well be willing to do so. Again, you could look for help to the History Committee, Breed Clubs, etc. You might even contact local agricultural publications who could use the information for a human interest story . . . and give you a copy to send to the Awards Committee and ultimately to the ADGA.